Gerard J. 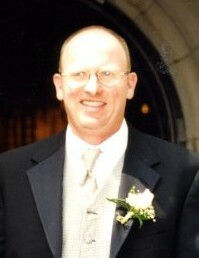 "Gerry" Ayers, Jr.
Gerard J. Ayers Jr., 57, of Williamsport, passed on Nov. 17, 2018, at the home of his brother, Geoff, sister-in-law, Jennifer, nephew, Malcolm, and niece, Amelia. He was born at Divine Providence Hospital on May 27, 1961, and was the first child of Gerard J. Ayers Sr., and the late Marie A. Ayers (Pietrafase), of Williamsport. He was raised in Williamsport, graduated from Loyalsock High School, in 1980, and graduated from Lycoming College in 1984, with a B.A. in Journalism. Gerry did not marry or father any children. The only immediate family members who have predeceased Gerry are his mother and niece, Eleanor. Gerry was remarkable for a number of reasons. He was unconventional in every aspect of his life. Extremely few of Gerry’s actions or decisions were based on, or conformed to, what most people generally do or believe. He saw no reason to enter the ‘rat race’, and he viewed any desk job with disdain (while feeling sorry for those cursed to such a fate). Although he held several jobs in the field of journalism, he was careful not to make it a career (because an office or desk would ruin it). Gerry’s work life was a mosaic of various pursuits (some serious and some casual), most of which related to tennis and high-performance automobiles. He very much enjoyed his time teaching tennis to the area’s youth (in both private lessons and the United States Tennis Association’s sanctioned group program), and working for many years for the Fairfield Auto Group and the Williamsport Country Club as a valet. His greatest passions in life were the sport of tennis (both playing and following professional players) and collecting cars and automobilia. After competing on the high school track team (specifically the 4 x 100 relay), Gerry discovered tennis and played on the Lycoming College tennis team. He developed into one of the best tennis players in the area, participating for decades in many leagues and winning many tournaments. He also enjoyed playing on a United States Tennis Association traveling team based out of Carlisle, Pa. He was especially proud of the fact that he had accomplished so much on a tennis court without ever having the benefit of a formal lesson. With respect to his interest in cars, he was recognized nationwide as an expert on certain models of Ford Mustangs (especially those modified by Ford’s Special Vehicle Operation Department), Ford’s Special Vehicle Team, and Steve Saleen), and certain Dodges modified by Carroll Shelby. He toured the Saleen manufacturing facility in California, and a sign that had been used in front of a Shelby plant now hangs in Gerry’s garage. He held nothing back, and used every minute of every day. Every time he competed, chased an item for his collection or wrote an article for publication, he put it all out there for each of us to see. Even through his final hours on his final day, he unabashedly invited the media to use his experiences to educate others and start conversations on the uncomfortable subject of death. Donations in Gerry’s memory may be made to the United States Tennis Association Foundation, or Ellie’s Heart Foundation (at any local Woodlands Bank branch). A public memorial service will be held at 10:30 a.m. on Wednesday, Nov. 28, at Trinity Episcopal Church located at 844 West Fourth Street in Williamsport. A reception immediately after the service will be held at the Williamsport Country Club.